Phebe Pollard married Gerry Houghton, son of Nathan Houghton and Patty Crosby. Calvin M. Houghton married Mary (?) in circa 1882 mar 18 years in 1900 census. Betsey (?) married Zalmon Houghton, son of Nathan Houghton and Patty Crosby. Julia A. Currier married Sumner Dinsmore, son of Arthur Dinsmore Jr and Patty Houghton, in May 28, 1854. Fred A. Dinsmore married Mary F. Beals in Mar 9, 1889 at ME, USA. Mary F. Beals married Fred A. Dinsmore, son of Sumner Dinsmore and Julia A. Currier, in Mar 9, 1889 at ME, USA. Marjorie (?) married John Collins Houghton, son of Luke Frank Houghton and Clarinda May Collins, w/1. Mary J. (?) married Marshall W. Houghton, son of Jonah Houghton and Charlotte Williams, in between 1879 and 1880. Marcia Ann Williams married Chester Houghton, son of Nathan Houghton Jr and Charlotte (? ), in Feb 28, 1843 at Anson, Somerset Co., ME, USA. Sarah Josephine Houghton married Elden Clinton Parlin in Sep 18, 1867 at Anson, Somerset Co., ME, USA, Parlin Gen.: Madison, ME. Elden Clinton Parlin married Sarah Josephine Houghton, daughter of Chester Houghton and Marcia Ann Williams, in Sep 18, 1867 at Anson, Somerset Co., ME, USA, Parlin Gen.: Madison, ME. 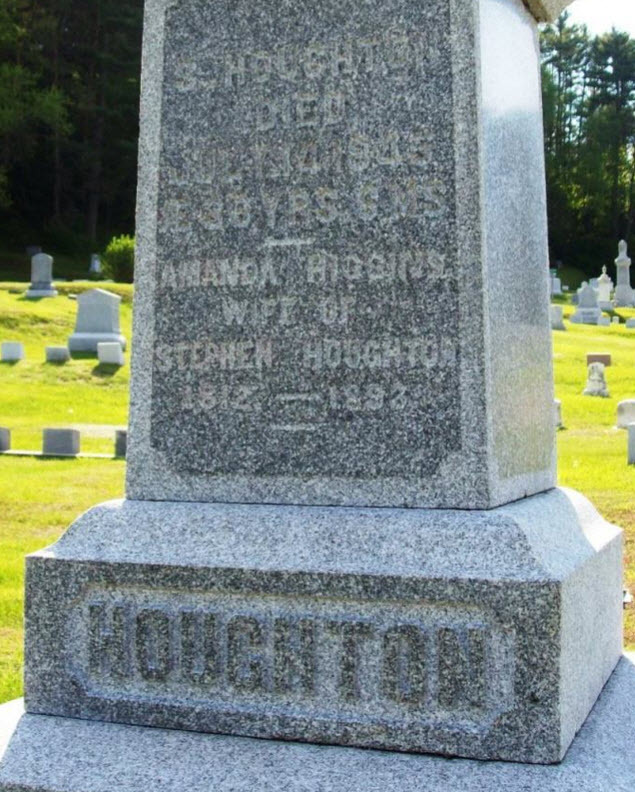 Amanda M. Higgins married Stephen Houghton, son of Abner Houghton and Susannah Taylor, in Dec 22, 1831 at Danville, Caledonia Co., VT, USA.